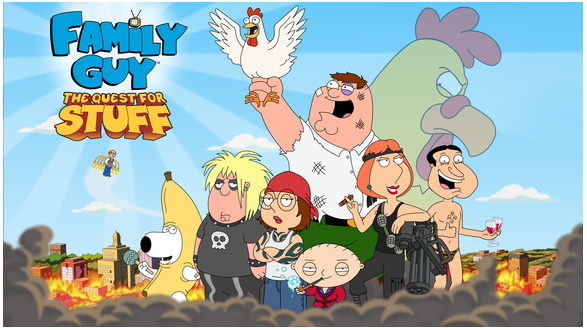 In the past month, mobile gamers were told that a new Family Guy game was going to be released. Recently the beta was released only for Android, but now the final app has been released to public on Android and IOS only moments ago. Many people have been judging the game before it was released saying it was similar to "Tapped Out". Many people thought this because of the same gameplay such as building things and doing quests. TinyCo, have done a good job with this game and trying to make it different, but it is still similar in some ways. This game was mainly inspired by the success of Tapped Out, and try to make Family Guy a bit more popular and get people to watch the show. The gameplay of this app is very similar to what the title states, "Quest For Stuff". You progress through the game by clicking on characters on completing the required quests. All quests are unique to each character and can be time consuming. Some tasks do take up to an hour and longer, so you must sit their and wait for the tasks to finish. This does get boring waiting after a while, but once you have finished longer quests you get bigger rewards. You can skip the waiting with a type of currency called Clams. Clams are hard to obtain throughout the game, so it does give you an option to buy Clams with real money. Some things in this game are highly overpriced which makes it almost impossible to get, resulting in the need to buy in-app purchases which are very pricy. That is only about all that is negative for this game. This game may not be the best at first release, but with more updates this game can be great fun. Some cutscenes are funny and enjoyable. The characters are a great representation of the TV show, and they provide great humour. The voice acting is also great. The graphics are also great, it may be in cartoon but I am running a iPod 4g. It runs great on my device and is amazing on the higher generation devices. I have not had any crashes or lag as well, which is great. Trying to build your city can be challenging at first, but once you progress through the game, complete quests and earn rewards it is fun trying to decorate it the way you look. It is a great game to compete with friends to see who can get the build the best Quahog city, after Peter Griffin has just destroyed it. I highly recommend this game to everyone because it is free and you can do whatever you want in the game. For all the little bugs in this game and the complaints, everything else is great. Go give this game a free download if you have not already, and if you don't enjoy it just simply delete.